The history of AI is a history of fantasies, possibilities, demonstrations, and promise. Ever since Homer wrote of mechanical “tripods” waiting on the gods at dinner, imagined mechanical assistants have been a part of our culture. However, only in the last half century have we, the AI community, been able to build experimental machines that test hypotheses about the mechanisms of thought and intelligent behavior and thereby demonstrate mechanisms that formerly existed only as theoretical possibilities. This book is about artificial intelligence, a field built on centuries of thought, which has been a recognized discipline for over 50 years. As Buchanan points out in the quote above, we now have the tools to test hypotheses about the nature of thought itself, as well as solve practical problems. Deep scientific and engineering problems have already been solved and many more are waiting to be solved. Many practical applications are currently deployed and the potential exists for an almost unlimited number of future applications. 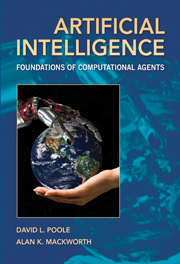 In this book, we present the principles that underlie intelligent computational agents. Those principles can help you understand current and future work in AI and equip you to contribute to the discipline yourself. Artificial intelligence, or AI, is the field that studies the synthesis and analysis of computational agents that act intelligently. Let us examine each part of this definition. An agent is something that acts in an environment – it does something. Agents include worms, dogs, thermostats, airplanes, robots, humans, companies, and countries. We are interested in what an agent does; that is, how it acts. We judge an agent by its actions. it makes appropriate choices given its perceptual and computational limitations. An agent typically cannot observe the state of the world directly; it has only a finite memory and it does not have unlimited time to act. A computational agent is an agent whose decisions about its actions can be explained in terms of computation. That is, the decision can be broken down into primitive operation that can be implemented in a physical device. This computation can take many forms. In humans this computation is carried out in “wetware”; in computers it is carried out in “hardware.” Although there are some agents that are arguably not computational, such as the wind and rain eroding a landscape, it is an open question whether all intelligent agents are computational. designing, building, and experimenting with computational systems that perform tasks commonly viewed as requiring intelligence. As part of science, researchers build empirical systems to test hypotheses or to explore the space of possibilities. These are quite distinct from applications that are built to be useful for an application domain. Note that the definition is not for intelligent thought. We are only interested in thinking intelligently insofar as it leads to better performance. The role of thought is to affect action. The central engineering goal of AI is the design and synthesis of useful, intelligent artifacts. We actually want to build agents that act intelligently. Such agents are useful in many applications. Artificial intelligence (AI) is the established name for the field, but the term “artificial intelligence” is a source of much confusion because artificial intelligence may be interpreted as the opposite of real intelligence. For any phenomenon, you can distinguish real versus fake, where the fake is non-real. You can also distinguish natural versus artificial. Natural means occurring in nature and artificial means made by people. A tsunami is a large wave in an ocean caused by an earthquake or a landslide. Natural tsunamis occur from time to time. You could imagine an artificial tsunami that was made by people, for example, by exploding a bomb in the ocean, yet which is still a real tsunami. One could also imagine fake tsunamis: either artificial, using computer graphics, or natural, for example, a mirage that looks like a tsunami but is not one. It is arguable that intelligence is different: you cannot have fake intelligence. If an agent behaves intelligently, it is intelligent. It is only the external behavior that defines intelligence; acting intelligently is being intelligent. Thus, artificial intelligence, if and when it is achieved, will be real intelligence created artificially. This idea of intelligence being defined by external behavior was the motivation for a test for intelligence designed by Turing , which has become known as the Turing test. The Turing test consists of an imitation game where an interrogator can ask a witness, via a text interface, any question. If the interrogator cannot distinguish the witness from a human, the witness must be intelligent. Figure 1.1 shows a possible dialog that Turing suggested. An agent that is not really intelligent could not fake intelligence for arbitrary topics. There has been much debate about the Turing test. Unfortunately, although it may provide a test for how to recognize intelligence, it does not provide a way to get there; trying each year to fake it does not seem like a useful avenue of research. The obvious naturally intelligent agent is the human being. Some people might say that worms, insects, or bacteria are intelligent, but more people would say that dogs, whales, or monkeys are intelligent (see Exercise 1 (page 42)). One class of intelligent agents that may be more intelligent than humans is the class of organizations. Ant colonies are a prototypical example of organizations. Each individual ant may not be very intelligent, but an ant colony can act more intelligently than any individual ant. The colony can discover food and exploit it very effectively as well as adapt to changing circumstances. Similarly, companies can develop, manufacture, and distribute products where the sum of the skills required is much more than any individual could master. Modern computers, from low-level hardware to high-level software, are more complicated than any human can understand, yet they are manufactured daily by organizations of humans. Human society viewed as an agent is arguably the most intelligent agent known. biology: Humans have evolved into adaptable animals that can survive in various habitats. culture: Culture provides not only language, but also useful tools, useful concepts, and the wisdom that is passed from parents and teachers to children. life-long learning: Humans learn throughout their life and accumulate knowledge and skills. These sources interact in complex ways. Biological evolution has provided stages of growth that allow for different learning at different stages of life. We humans and our culture have evolved together so that humans are helpless at birth, presumably because of our culture of looking after infants. Culture interacts strongly with learning. A major part of lifelong learning is what people are taught by parents and teachers. Language, which is part of culture, provides distinctions in the world that should be noticed for learning. Throughout human history, people have used technology to model themselves. There is evidence of this from ancient China, Egypt, and Greece that bears witness to the universality of this activity. Each new technology has, in its turn, been exploited to build intelligent agents or models of mind. Clockwork, hydraulics, telephone switching systems, holograms, analog computers, and digital computers have all been proposed both as technological metaphors for intelligence and as mechanisms for modeling mind. About 400 years ago people started to write about the nature of thought and reason. Hobbes (1588–1679), who has been described by Haugeland , p. 85] as the “Grandfather of AI,” espoused the position that thinking was symbolic reasoning like talking out loud or working out an answer with pen and paper. The idea of symbolic reasoning was further developed by Descartes (1596–1650), Pascal (1623–1662), Spinoza (1632–1677), Leibniz (1646–1716), and others who were pioneers in the philosophy of mind. Any effectively computable function can be carried out on a Turing machine (and so also in the lambda calculus or any of the other equivalent formalisms). Here effectively computable means following well-defined operations; “computers” in Turing’s day were people who followed well-defined steps and computers as we know them today did not exist. This thesis says that all computation can be carried out on a Turing machine or one of the other equivalent computational machines. The Church–Turing thesis cannot be proved but it is a hypothesis that has stood the test of time. No one has built a machine that has carried out computation that cannot be computed by a Turing machine. There is no evidence that people can compute functions that are not Turing computable. An agent’s actions are a function of its abilities, its history, and its goals or preferences. This provides an argument that computation is more than just a metaphor for intelligence; reasoning is computation and computation can be carried out by a computer. Once real computers were built, some of the first applications of computers were AI programs. For example, Samuel  built a checkers program in 1952 and implemented a program that learns to play checkers in the late 1950s. Newell and Simon  built a program, Logic Theorist, that discovers proofs in propositional logic. which argued that the representations learned were inadequate for intelligent action. These early programs concentrated on learning and search as the foundations of the field. It became apparent early that one of the main problems was how to represent the knowledge needed to solve a problem. Before learning, an agent must have an appropriate target language for the learned knowledge. There have been many proposals for representations from simple feature-based representations to complex logical representations of McCarthy and Hayes  and many in between such as the frames of Minsky . During the 1960s and 1970s, success was had in building natural language understanding systems in limited domains. For example, the STUDENT program of Daniel Bobrow  could solve high school algebra problems expressed in natural language. Winograd’s  SHRDLU system could, using restricted natural language, discuss and carry out tasks in a simulated blocks world. CHAT-80 [Warren and Pereira, 1982] could answer geographical questions placed to it in natural language. Figure 1.2 shows some questions that CHAT-80 answered based on a database of facts about countries, rivers, and so on. All of these systems could only reason in very limited domains using restricted vocabulary and sentence structure. During the 1970s and 1980s, there was a large body of work on expert systems, where the aim was to capture the knowledge of an expert in some domain so that a computer could carry out expert tasks. For example, DENDRAL [Buchanan and Feigenbaum, 1978], developed from 1965 to 1983 in the field of organic chemistry, proposed plausible structures for new organic compounds. MYCIN [Buchanan and Shortliffe, 1984], developed from 1972 to 1980, diagnosed infectious diseases of the blood, prescribed antimicrobial therapy, and explained its reasoning. The 1970s and 1980s were also a period when AI reasoning became widespread in languages such as Prolog [Colmerauer and Roussel, 1996; Kowalski, 1988]. During the 1990s and the 2000s there was great growth in the subdisciplines of AI such as perception, probabilistic and decision-theoretic reasoning, planning, embodied systems, machine learning, and many other fields. There has also been much progress on the foundations of the field; these form the foundations of this book. AI is a very young discipline. Other disciplines as diverse as philosophy, neurobiology, evolutionary biology, psychology, economics, political science, sociology, anthropology, control engineering, and many more have been studying intelligence much longer. The science of AI could be described as “synthetic psychology,” “experimental philosophy,” or “computational epistemology”– epistemology is the study of knowledge. AI can be seen as a way to study the old problem of the nature of knowledge and intelligence, but with a more powerful experimental tool than was previously available. Instead of being able to observe only the external behavior of intelligent systems, as philosophy, psychology, economics, and sociology have traditionally been able to do, AI researchers experiment with executable models of intelligent behavior. Most important, such models are open to inspection, redesign, and experiment in a complete and rigorous way. Modern computers provide a way to construct the models about which philosophers have only been able to theorize. AI researchers can experiment with these models as opposed to just discussing their abstract properties. AI theories can be empirically grounded in implementation. Moreover, we are often surprised when simple agents exhibit complex behavior. We would not have known this without implementing the agents. It is instructive to consider an analogy between the development of flying machines over the past few centuries and the development of thinking machines over the past few decades. There are several ways to understand flying. One is to dissect known flying animals and hypothesize their common structural features as necessary fundamental characteristics of any flying agent. With this method, an examination of birds, bats, and insects would suggest that flying involves the flapping of wings made of some structure covered with feathers or a membrane. Furthermore, the hypothesis could be tested by strapping feathers to one’s arms, flapping, and jumping into the air, as Icarus did. An alternate methodology is to try to understand the principles of flying without restricting oneself to the natural occurrences of flying. This typically involves the construction of artifacts that embody the hypothesized principles, even if they do not behave like flying animals in any way except flying. This second method has provided both useful tools – airplanes – and a better understanding of the principles underlying flying, namely aerodynamics. AI is intimately linked with the discipline of computer science. Although there are many non-computer scientists who are doing AI research, much, if not most, AI research is done within computer science departments. This is appropriate because the study of computation is central to AI. It is essential to understand algorithms, data structures, and combinatorial complexity to build intelligent machines. It is also surprising how much of computer science started as a spinoff from AI, from timesharing to computer algebra systems. Finally, AI can be seen as coming under the umbrella of cognitive science. Cognitive science links various disciplines that study cognition and reasoning, from psychology to linguistics to anthropology to neuroscience. AI distinguishes itself within cognitive science by providing tools to build intelligence rather than just studying the external behavior of intelligent agents or dissecting the inner workings of intelligent systems. AI is about practical reasoning: reasoning in order to do something. A coupling of perception, reasoning, and acting comprises an agent. An agent acts in an environment. An agent’s environment may well include other agents. An agent together with its environment is called a world. An agent could be, for example, a coupling of a computational engine with physical sensors and actuators, called a robot, where the environment is a physical setting. It could be the coupling of an advice-giving computer – an expert system – with a human who provides perceptual information and carries out the task. An agent could be a program that acts in a purely computational environment – a software agent. Two deterministic agents with the same prior knowledge, history, abilities, and goals should do the same thing. Changing any one of these can result in different actions.